Growing on the upper shore, but still washed by the tide. Forms a green carpet on damp sandy shores. The stems are roundish, very fleshy, glaucous green, and will snap cleanly if bent enough. Taller stems can be branched, taking on the appearance of miniature desert cacti of the type often seen in Cowboy films of old. 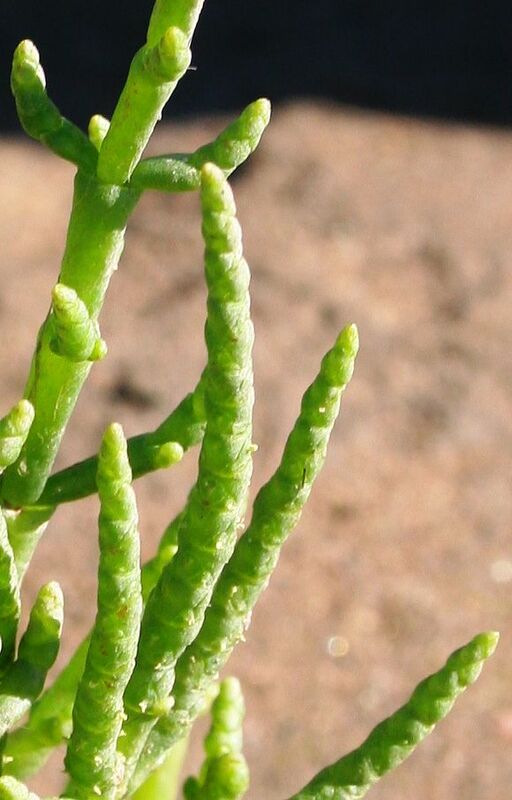 When picking Glasswort for eating, care must be taken to snap it off cleanly without disturbing the roots from which the plant will re-grow. Showing minute yellow flowers like tiny grains of sand. 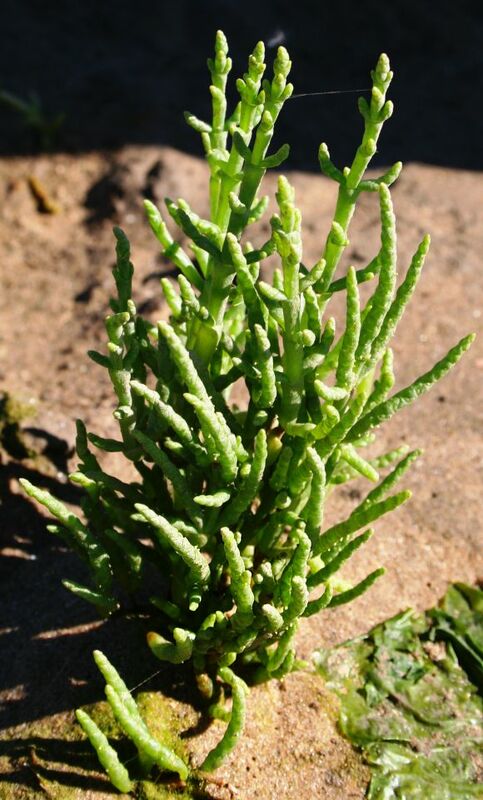 Some similarities to : Some other Glasswort s and Samphire s and also to Annual Sea-blite. From a distance Glasswort could be mistaken for Annual Sea-blite because it is much the same height, grows in much the same kind of places, and looks similar in that it is glaucous, and has a 'Wild West cactus' look about it (apart from the huge size difference). Those who call it 'Poor Man's Asparagus' must not have seen the exhorbitant prices some vendors charge for it (although you could collect it yourself for free if you lived in an appropriate place). Not to be conused with: Asparagus nor with 'Poor Man's Weatherglass' [a plant with similar nickname]. Has yellow flowers so small that, when present, they look like grains of sand. 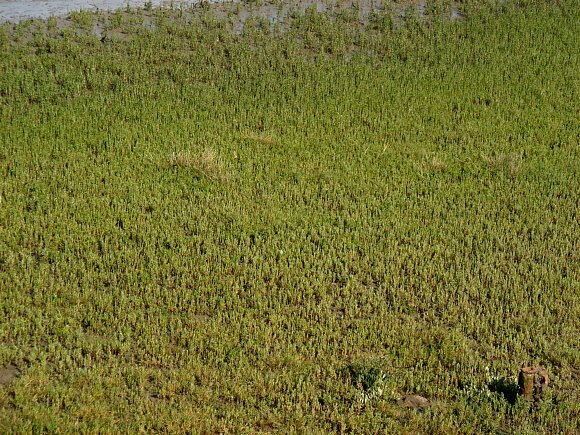 Common Glasswort is edible raw, if crispy and very salty. It can also be cooked like asparagus. Being in the sea, glasswort contains a lot of salt dissolved in its internal fluids. If it contained only pure water, without the salt, osmotosis would soon dry the plant out. 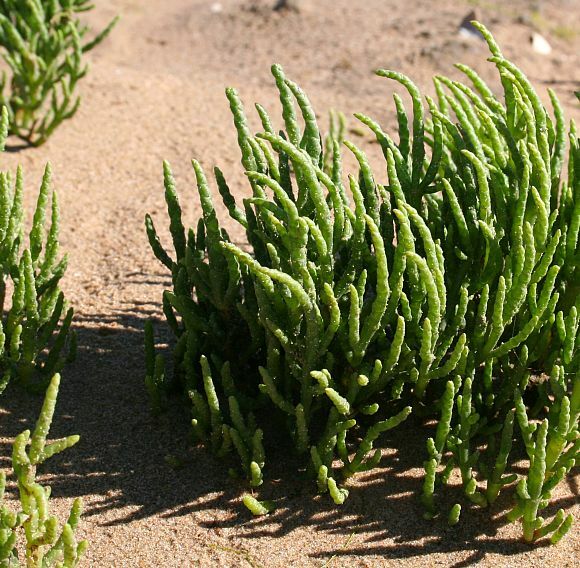 Because of it's high sodium content, glasswort was once used inn the making of glass, hence the name glasswort. The glasswort was dried, then burnt in great heaps, reducing it to ashes, containing a lot of salt. The ash was heated with sand (itself plentiful where glasswort typically grows) until the sand and ash fused into a crude glass. 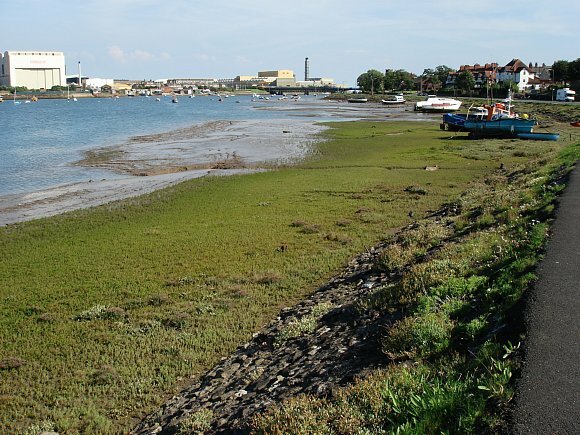 Another use for the high salt-content ash obtained by burning glasswort is in the making of caustic soda. The ash was leached with limewater producing a solution of caustic soda. The caustic soda so produced was evaporated into crystals of sodium hydroxide, mixed and heated with animal fats so producing soap. However, glasswort is not another name for soapwort, a totally different plant. 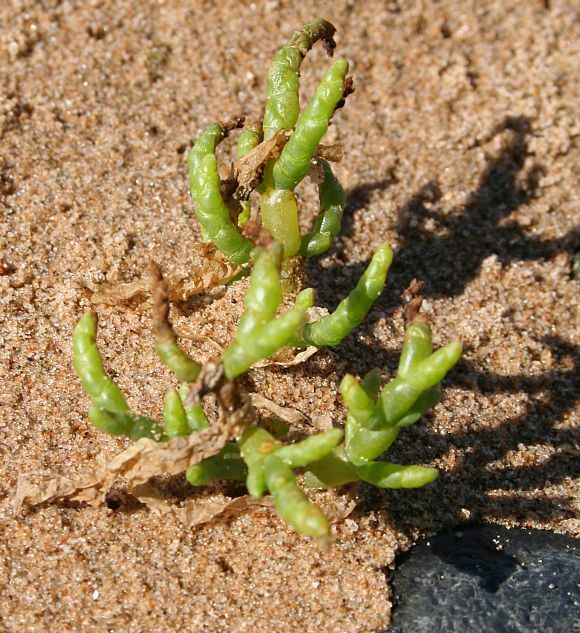 The green shoots of Glasswort can be eaten raw, like a crunchy snack, when it has a very salty taste. Or it can be boiled and served with butter like asparagus.